What goes down in New Music these days is nearly wide open. The Modern project can now go nearly anywhere and of course Post-Modern is a name we might give it. In the end Post-Modernist music is whatever is not of the bleep-bloop sort. That only means it is Modern without being typical of the High Modernism of, say, the early '70s. 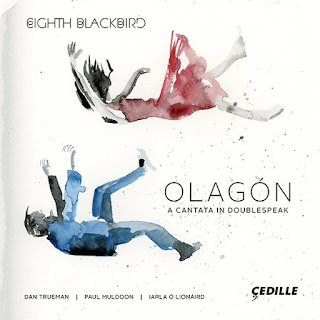 Something very much a part of the excitement of open possibilities is an album, a two-CD recording of Olegon: A Cantata in Doublespeak (Cedille CDR 90000 174). The music was composed by Dan Trueman with Iarla O Lionaird. The lyrics are by Paul Muldoon. Iarla is the principal vocalist. Truman plays the fiddle. 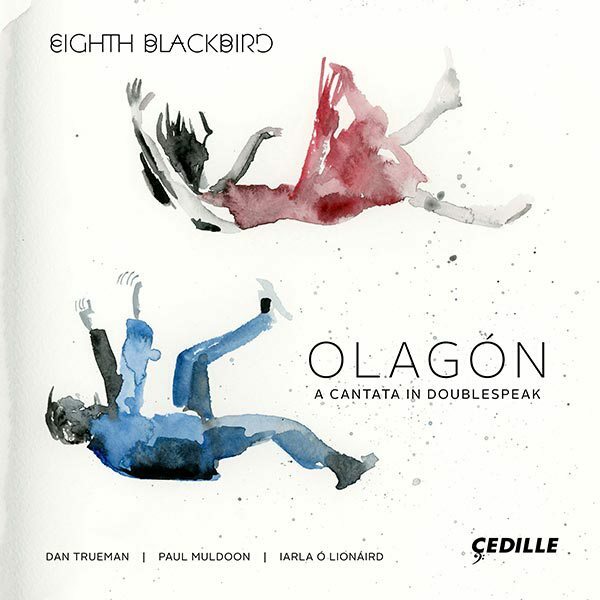 Eighth Blackbird executes the chamber score and sings additional, mostly ensemble vocals. It is beautiful, this. It has true lyric memorability, an intriguing score of chamber instruments and some electronic enhancement. Iarla is central as the vocalist, not singing in any trained operatic way, but more in a singer-songwriter way with distinct Irish overtones, real contemporary song form. There are some lovely part-singing sections as well. It is a work of rare provenance, tonal but modernly adventurous. A kind of "Escalator Over the Hill" (Carla Bley) for the present-day, but utterly different and original. I am taken by this music. There is ever a place for me for beauty and poetic, winsome suchness. Olagon gives you more of it than you might have a right to expect nowadays. And we are all the better for it. Hear this one if you look for endless song.